Salmon is my go to for entertaining, whether it’s a dinner party or a girlfriend lunch and the key is knowing how to prepare salmon that’s perfect every time. Salmon cannot be overcooked or it loses it’s buttery sweetness; yet, the skin needs to be crispy. You’ll know you’ve overcooked it if you see the white protein bleeding over. It’s better to undercook it a little because it will continue cooking for a few moments and its easier to put it back in the pan, if need be. There are so Many Ways to Prepare Salmon. I’ve grilled salmon it very simply. 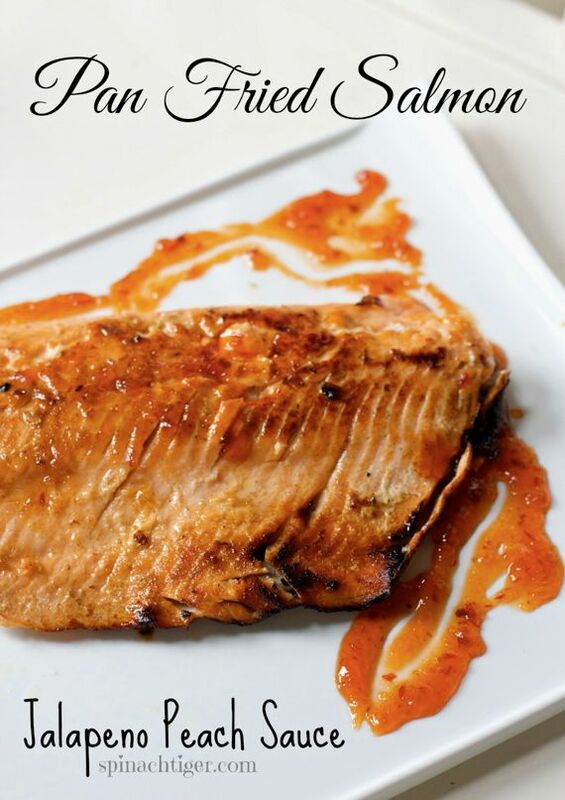 I’ve pan fried salmon in a sweet and spicy peach sauce. I’ve roasted salmon in the oven. There are many nights I’ll make salmon very simply, with just olive oil, salt, pepper. But then sometimes I dress it up with sweet potato strings and crispy kale or a bed of tarragon scented pea mash. This time, I’ve pan fried the salmon, and then put it back in the oven, because I wanted the crispiest skin possible without overcooking. I generally start my pan frying in a hot pan skin side up, which may seem counter intuitive, but it only takes a few minutes to brown the top. Once it’s done, it slides easily in the pan, and can be turned over, about 4-5 minutes. At this point, you can continue on top of the stove until the skin seizes up and the salmon is removed easily, or you can stick it in the oven at 400 Degrees F. on the bottom rack for about five minutes. I’ve made this dozens of times and it always comes out perfect. 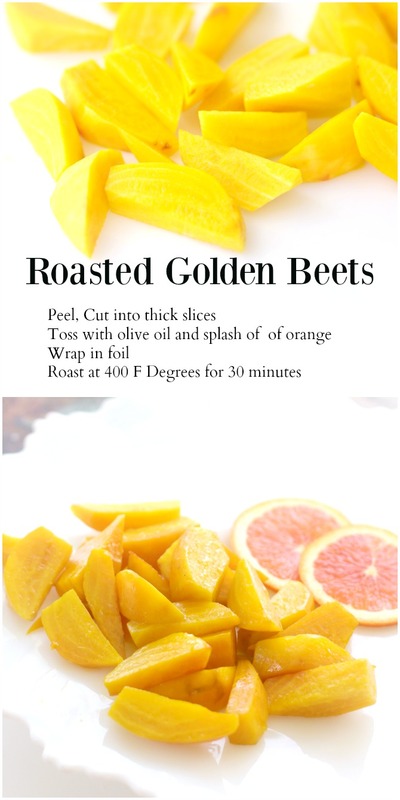 The golden beets will have to be done in advance, wrapped in foil for about 30 minutes. Once cooked, you can toss them into the pan right along side the salmon, and pour the rest of the marinade. I used the a similar marinade which I used in this recipe but am pan roasting and using twice as many beets, making them the star of the dish this time. 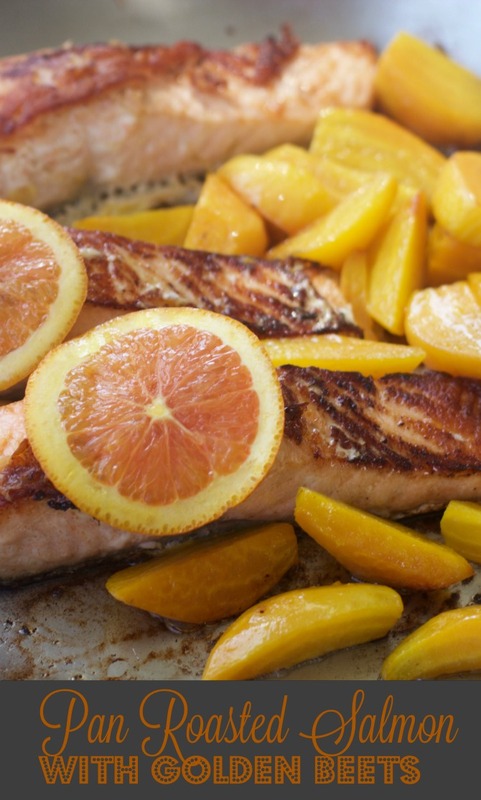 Pairing golden beets with salmon is not just tasty but beautiful. So tell me, do you cook with golden beets and how do you best like your salmon. 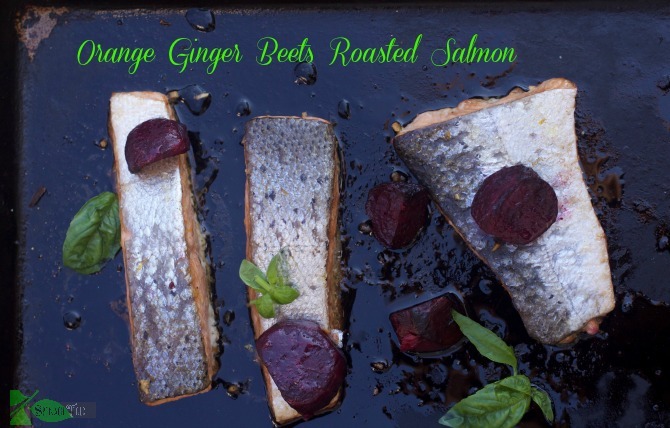 Delicious dinner of crispy salmon with sweet orange ginger beets. Mix olive oil shallots, ginger, orange juice, zest and garlic in a bowl. Toss beets with just enough of this mixture to moisten. Wrap in foil. Roast beets for 30 minutes at 400. 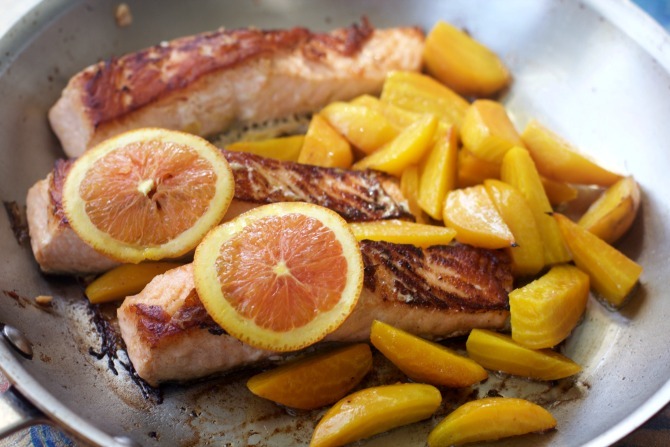 Take salmon out, season with salt, a tablespoon of marinade, have it rest to room temperature while beets are cooking. Place some oil in pan and turn to medium high heat. Place salmon in pan skin side up until well browned. Turn over and cook until skin is crispy. This takes about 4-5 minutes. Pour remaining marinade while continuing to cook. At this point, as you turn the salmon over, as on option, you can put salmon in oven at 400 degrees F. on lower rack for about five minutes. 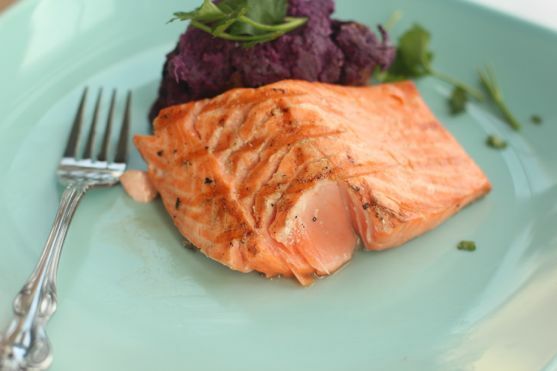 Salmon is one of our very favorites but finding wild caught salmon is getting harder and harder. We won’t purchase farm raised. That may seem a little snobby but it’s actually the taste. When we eat out?? I normally get seafood. I’ve tried salmon several ways — one of our favorites is with balsamic glaze but I like your use of the beets and orange not only looks gorgeous but sounds delicious. Will definitely be trying it! Buona Pasqua! I love the combination of a nice sear in a pan, and then a finish in the oven. The texture looks PERFECT! We love salmon! We will have to give this a go. Thank you!